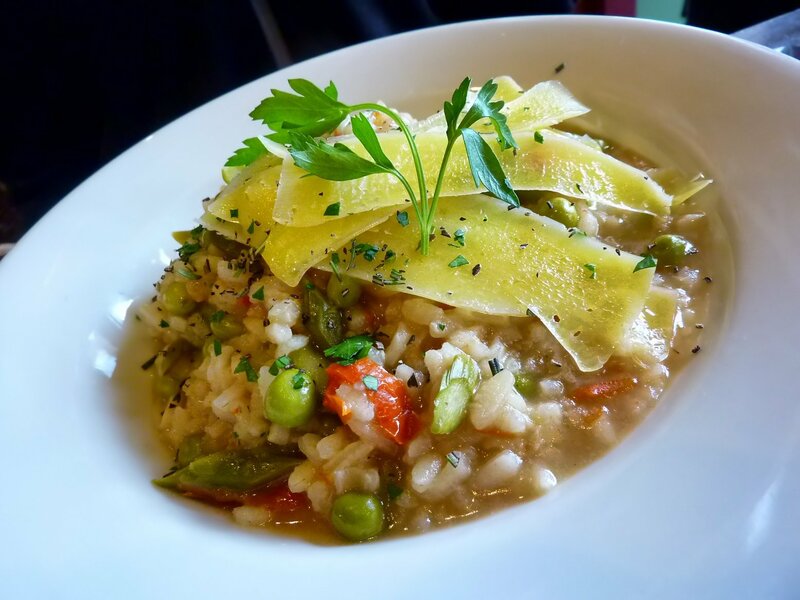 Traditionally Italian, Risotto can be cooked in various ways and is made with rice as primary ingredient. It resembles to Indian style ‘Khichdi’ but differs in the basic fact that Khichdi is made with washed – rinsed rice whereas risotto is cooked with raw rice and starch. Contrary to perception, vegetable risotto can easily be made at home. If you’ve never tried it before, explore this tasteful variety of rice and charm your loved ones. Put a deep wide pan on medium heat with 1 tablespoon butter in it. When the butter melts add chopped onions and sauté for 5 – 6 minutes or until slightly browned. Meanwhile put a saucepan on low medium heat with vegetable stock in it and bring to a simmer. Add raw rice into sautéed onions, stir and roast for 2 – 3 minutes to coat well with melted butter and then pour in 1 cup of simmering stock. Stir until the stock is almost completely absorbed in. Then add another cup of simmering stock and so on until the half of stock has been absorbed by the rice. Add frozen green peas along with one cup of stock, cook for 4 – 5 minutes; then add pre-boiled carrots and green beans along with one more cup of stock. Keep stirring occasionally and adding in stock until risotto is nicely cooked and is aromatic. Season with salt and freshly ground black pepper, stir once and turn off the heat. Add in rest of butter and let it melt, stir once again then transfer to a serving platter. Top it with pickled vegetables and a spring of coriander or parsley. Serve hot! Tip: You may add some grated cheese after the risotto is cooked.